iBall Slide 3G 7271 HD70 has been officially launched at price of RS 8,299. 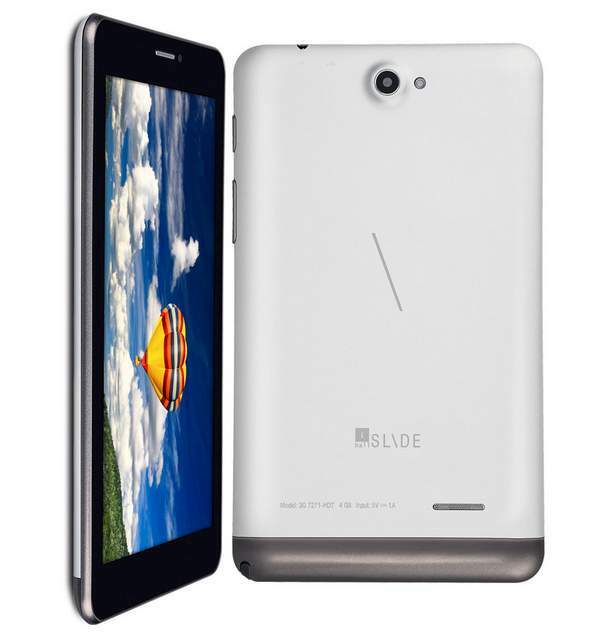 The new iBall Slide 3G 7271-HD tablets comes with some good specifications at this price point. It will compete with Micromax P410 Funbook mini , Swipe Halo Value + and Domo Slate X3g . Apart from the Big 7 inch screen, the device also allows you to make voice and Video calls via built in SIM card slots. The Tablet has Sim Card slot with 3G connectivity. The IBALL Slide 7271 HD-70 comes with a 7inch Capacitive multi touch capacitive Display having 1024 x 600 pixels resolution and 5 point multi touch. It is powered with 1.3Ghz dual core Cortex A7 CPU paired with 1GB of RAM. For Video and Photography there is 2-megapixel primary shooter and a VGA front imager.